Identification: Wings are dark brown-black. Forewing has a wide yellow band, and a small white patch near the apex. 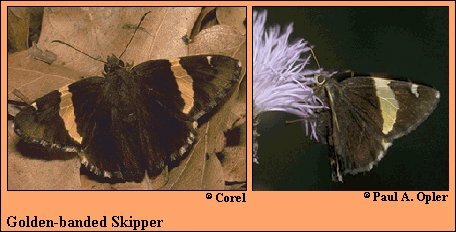 Underside is dark brown with 2-3 darker bands; hindwing margin may have gray overscales. Life history: Adults are active in the late afternoon. To seek females, males perch in gullies on rocks or up to 6 feet above ground on vegetation. Females lay eggs in strings of 2-7 at the base of host plant leaflets. Caterpillars live in shelters of rolled or tied leaves and emerge at night to feed on leaves. Chrysalids hibernate. Flight: Two broods; from May-August in the north, April-September in the south. One brood from June-September in southern Arizona. Caterpillar hosts: New Mexico locust (Robinia neomexicana) and hog peanut (Amphicarpa bracteata). Adult food: Nectar from flowers including trailing arbutus, blackberry, abelia, and hollyhock. Habitat: Damp, wooded ravines with permanent water sources. Range: In the west from central Arizona, southwest New Mexico, and west Texas south to central Mexico. In the east from Maryland south to South Carolina, west to eastern Oklahoma and northeast Texas. Isolated population in northern Florida.